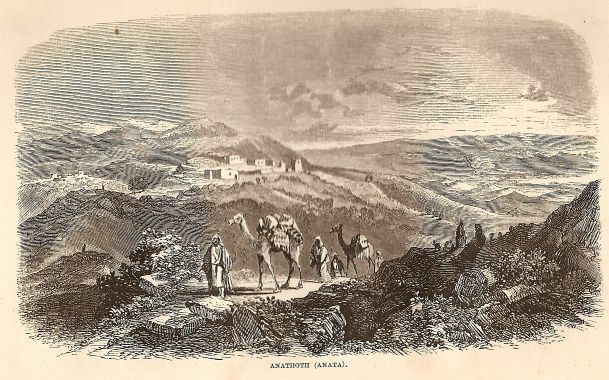 Anathoth (Anata), Palestine, picture p. 549 in W. M. Thomson: The Land and the Book; or Biblical Illustrations Drawn from the Manners and Customs, the Scenes and Scenery of the Holy Land. Vol. II. New York, 1859. In 1936, Avraham Biran carried out a small sounding at Ras el Harube, on a hill northeast of Jerusalem. Nearby is the site known as Deir e-Sid, where further soundings uncovered an Iron Age II village. Each of these surveys sought to identify the location of the Biblical Anatot (Josh 21:13,18; 1 Chr. 6:54,60; 7:8; 12:3; 2 Samuel 23:27; Jer. 1:1; 29:27; 32:7-9; Neh. 7:27; 10:19; Ez. 2:23). Bergman, A., Soundings at the Supposed Site of OT Anathoth, BASOR62 (1936), pp. 22-26.